Hi there - such a fun day....we're starting a photo contest. As you might know, THE BEAUTIFUL MYSTERY is set in a remote monastery, so this got us thinking about sacred places. Churches, perhaps. But really places were you feel at peace. Calm and secure. Blissful even. People talk about the 'Third Place'. There's home. There's work. Then there's the Third Place, where your spirit lives, and thrives. In anticipation of the launch of THE BEAUTIFUL MYSTERY on August 28th, I'd love to see a picture of your sacred place. We can create a sort of 'sacred and safe community.' I want to start it off by showing you one of mine...this is the view from my office. When I get tired, or discouraged, I step outside onto the verandah, take a deep breath in, a deep breath out, and let the peace wash over me. And I know that all will be well. 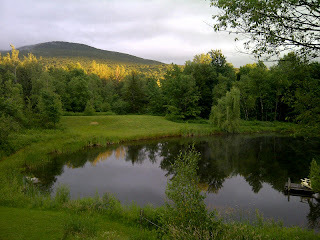 If you post a photo of your special place you might win a signed, framable, print of the cover of THE BEAUTIFUL MYSTERY. 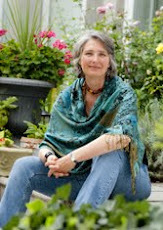 Here's the link (http://bit.ly/SpiritOfPlacePhoto). If you follow it, there'll be step-by-step instructions on what to do. We want to make this easy. But - if you have any trouble, just let me know. Enjoy! And thank you for giving so much of yourself. Wet and cool. Am back home, and loving it. Spent the day at the office - next door. Writing. Ahhh. Now, we have a treat for many of you who're curious about THE BEAUTIFUL MYSTERY! As you know, the book won't be coming out until August 28th - but as a huge thank you for all your support, and for spreading the word, we've set up a link for you to read excerpts of the book, as well as from A TRICK OF THE LIGHT, in case you haven't read it yet. Hope they work! Mostly, I hope you enjoy the excerpts. Happy first day of summer! Happy solstice! It's going to be a scorcher...can't believe I'm still in Montreal writing and not home, by the pool and garden. My "quiet place in the bright sunshine". But, soon. Almost there. And great incentive to keep at it. Minotaur Books has posted the coolest blog! It's by the brilliant David Rotstein, the Art Director of Minotaur Books. On the blog now he talks about how he came up with the design for the cover of THE BEAUTIFUL MYSTERY - all the previous attempts, what they were aiming for. The struggles and the inspiration. I know so many of you are interested in art and creation of any type - you'll love this! Here's the link - enjoy - and happy Summer...stay cool. It has been an embarrassment of great news lately. Good thing I'm not easily embarrassed, or dissuaded from spreading the good news! “beautiful mystery”)? Yes, indeed, and in the hands of the masterful Penny, the topic proves every bit as able to transfix readers as the chants do their listeners. It begins when the choir director of a monastery in a remote corner of Quebec is murdered, his skull bashed in with a rock. Outsiders are not allowed inside the monastery’s walls, where 24 cloistered monks pray, make chocolate, and sing—though a few years earlier, a homemade recording of their chants was released and created a sensation, helped along by the inaccessibility of the artists. Now, with the murder, the doors of the monastery are opened to Chief Inspector Armand Gamache and Inspector Jean-Guy Beauvoir, charged with finding a killer among a group of largely silent monks, who, it quickly becomes apparent, are engaged in a civil war over their music, but one “fought with glances and small gestures”—until now, when rocks have been added to the arsenal. P. D. James, of course, has made a career out of taking her sleuth, Adam Dalgliesh, into closed worlds to investigate murders, and while Penny follows that formula, she layers her plots more intricately than does James, this time adding an entire contrapuntal plot concerning Gamache, Beauvoir, their relationship, the secrets each conceals, and the demons each continues to fight. “The deepest passions could appear dispassionate, the face a smooth plain while something mammoth roiled away underneath,” Gamache thinks, expressing not only his frustration with the case but, inadvertently, the coming crisis in his relationship with Beauvoir. Of course, there is always something mammoth roiling away beneath the surface of Penny’s novels—but this time the roiling is set against the serenity of the chanting, producing a melody of uncommon complexity and beauty. Before I started my publishing career I didn't realize that, in the US, there are four publications of note, that will review a book before it comes out. They're VERY influential, since they help booksellers and librarians decide on a book - because they can't read them all. Getting a starred review is never a given, and never, ever taken lightly. Much celebrating!! 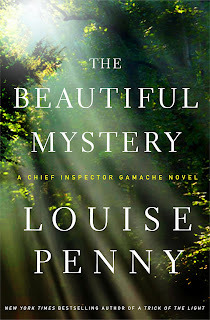 The Beautiful Mystery comes out August 28th. Yay! I started today quite nervous - my Quebec publisher, Flammarion Quebec, had organized a big breakfast at this marvlous restaurant called Soupesoup - and invited all the big booksellers and representatives. A room packed with all the people you really want to meet. And impress. she asked me to do a presentation - in French. It was too late to back out (but don't think I didn't consider it!). So I spent much of last night, and early this morning, pacing the floor, practicing. Very stressful. But it all turned out all right. I think. Well, no one died. or threw food. As you see, the bar is set pretty low for my public events. Now, I suspect you think I'm making all this up, at this stage (and part of me suspects the same thing!) but I heard late yesterday that A TRICK OF THE LIGHT has been nominated for the Macavity Award for Best Crime Novel in the US! This is an award voted on by members of a fabulous couple of sites - Mystery Readers International and Mystery Readers Journal - and is one of the most coveted prizes. Thank you to everyone who voted for A TRICK OF THE LIGHT. Makes a great reading list! Like the Anthony Award, the winner will be announced at Bouchercon, in Cleveland, in early October. Still Life - the movie! Great news! The Canadian Broadcasting Corporation has 'greenlit' the film of STILL LIFE! As some of you know, the film was optioned a year or so ago....but that's far from a guarantee it will be made....but thanks to a great production company, and script, the CBC has made it one of only three films they're producing this year. The news was announced yesterday at the Banff International TV conference. STILL LIFE (Three Pines Productions): Based on the award-winning novels by international best-selling author Louise Penny, comes an event TV movie about murder in a small town. The village of Three Pines, Quebec may seem tranquil, but all is not as it appears. In this psychological thriller that combines Hitchcock with Christie, death comes to this peaceful Eden, and brings with it Chief Inspector Armand Gamache, the head of Homicide for the Surete du Quebec. Here he discovers that nature, both human and otherwise, is capable of great beauty, and great cruelty. Beneath the exterior of the pretty little village, dark secrets lie hidden. Behind cheerful smiles, hurtful thoughts swirl. As he digs deeper, Chief Inspector Gamache finds old sins, buried alive. Rancid and stinking. And now, one of those secrets has surfaced, and created a corpse. C.I. Gamache must follow the trail of smiles and lies, of courtesy and cruelty. To the killer. In a rare starred review, Kirkus Review in the US said, 'If you don't give your heart to Gamache, you may have no heart to give.' Charming, urbane, intelligent and kind, Armand Gamache has been hailed internationally as a cop like no other. Next comes the fun part...casting! Excited and nervous about that. Vital to get it right....and we'll do our best, believe me! Especially Gamache. Will let you know all the news as the planning moves forward. I know you're as anxious as I am! Congratulations, everyone. And a special 'shout out' to my good friend Julia Spencer-Fleming for her fabulous book ONE WAS A SOLDIER. And to Reed Farrel Coleman - a wonderful writer, and great guy. 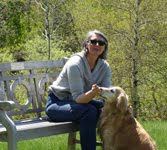 Wish Deborah Crombie's amazing book, NO MARK UPON HER was on the list. Deserves to be, in my opinion. As does GM Maillet's book. But huge congratulations to those who made the Anthony list! I know A TRICK OF THE LIGHT is there only because many of you voted for it. Thank you - deeply and sincerely. I cannot begin to tell you what your support means to me. The award will be decided, and given out, at Bouchercon, the crime fiction fest, in October. It's in Cleveland this year. If you love crime fiction, and can get to it, many of the top writers in the world will be there, and you'll get to meet them, mingle with them, see them on panels. It's thrilling. Perfect day, after more torrential rains last night - with hail! 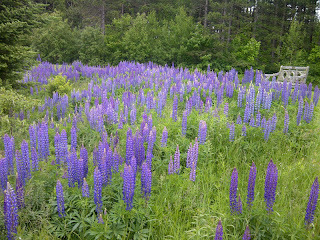 Wanted to show you our lupins. The bench was a gift to Michael from me a few years ago - for his birthday. There's a plaque on it with his name, and birthday, and the inscription, 'Surprised by Joy'. And how could we not be? Life continues busy - took publicity shots with Gary the other day. always fun with him. He relaxes me - such an old and good friend. Cheryl, his wife, is one of my best friends. Had breakfast with her on Friday morning. So exciting to know we're getting closer and closer to the Aug 28th launch of THE BEAUTIFUL MYSTERY! They're still working on the tour schedule....but as soon as I know it, I'll tell you. 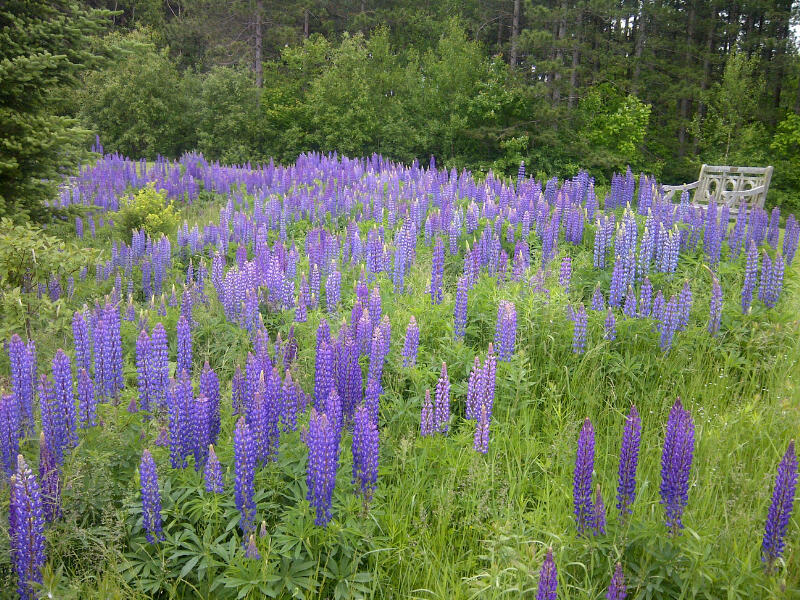 Lovely walk again yesterday....back to Victoria Ave. I try to stroll, not march - but I think I'm a marching/mumbling type of person. I will make a great neighbourhood crank one day...soon. Meandering around humming Eminem songs and talking to myself about what needs to happen next. Occasionally having arguments with invisible people. It's nice to have an aspiration. Happily, I have the wardrobe for it already. Getting closer to "the end" of the book. I feel as though, with this manuscript, I've turned the final corner. The end is still a distance away, but now in sight. But, as those of you who've been through this with me with previous books know, the end is fluid. Always seems to be moving away. I'll think one more day should do it - but after a day, it remains just out of reach. I'm not one day away, I know that - but perhaps two weeks. My goal is to be finished this first draft by the end of June. I'm very goal-oriented. Doesn't mean i hit the goal, but I find it helps give me direction - something to aim for. Discipline and purpose - two things I've found helpful in writing books. Perhaps because I'm so innately lazy. I work ferociously hard, so that I can do nothing. have more time more meandering and mumbling. VERY cold...thinking of taking a hot shower just to warm up. Am in Montreal, trying to get some quiet time to move the first draft ahead. It's going very well, but I find I'm much happier, more relaxed and the writing goes better if every now and then I remove myself and concentrate simply on the book. had a lovely walk yesterday - over to Victoria Ave in Westmount. Picked up some things for dinner and a couple of DVDs. Today, staying in to write. In the June newsletter I sent out, I used a quote at the top. Indeed, each newsletter has a quote I've found. This one was slightly different in that I didn't know who said it, but I have it taped to the top of my laptop. The rule now is, be humble and play to your strengths. Birna Einarsdottir, one of the bank CEOs appointed to displace the male immediately after the crash of 2008, said that the big lesson Icelanders had learnt in emerging out of recession into growth had been "to stick to what we know; not to get too clever". "Who said Icelanders were the best bankers in the world? Where did that come from? So the rule now is, be humble, know your limitations and play to your strengths. And instead of thinking you know everything, ask questions; seek help." Which is what women do, not men. Hope it works. In the meantime, the quote continues to inspire me.